Facebook Messenger Update: In 2015, Facebook had introduced personal digital assistant M for Messenger. Now, the social network has launched suggestions from AI-powered assistant M in Messenger for users in the US. M offers suggestions by popping into an open conversation to suggest relevant content. 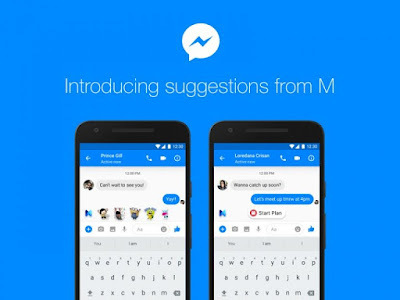 The Facebook says it has been testing suggestions from M with a small percentage of users for the past few months and is now expanding it to all users in the US. M will suggest you fun stickers for your daily life interactions like “Thank you” or “Bye-Bye.” M relies on AI machine learning techniques. It suggests relevant actions to help manage conversations or help get things done. It will recognize when people are discussing payments and gives them an option of sending or requesting money. M can suggest an option to share your location during a conversation. If you are talking about getting together, M will help to coordinate a plan. In case you are having a conversation about going somewhere, M will suggest “Get A Ride” and shares an option of Lyft or Uber. M will learn and improve with more use and offer better suggestions.You can disable M by muting it from Settings. Messenger users across the globe will also start to see a redesigned way to compose messages. It is currently available for all iOS and Android users in the US and will eventually roll out to other countries.